An environment free of judgment is essential to the development and well-being of adults with autism. Sophie has found that judgment-free environment at the Green Care Farm (formerly Home on the Range Autism Ranch), a sustainable care farm just east of Edmonton that develops the social, emotional and agricultural skills of adults and youth with autism. These ‘Farmers’, as they’re called, learn to grow organic food, care for farm animals, and increase their literacy skills in farming-related lessons and activities. They might discover a caterpillar one day and want to learn more, so the literacy program will focus on caterpillars to satisfy their curiosity. They also share moments like “catching a frog, feeding the lambs and doing silly dances together”. Farmers at the Green Care Farm get to be in nature and contribute to their community. They sell the fruits and vegetables they grow as 'veggie boxes'. It’s a strong social enterprise model that, although only grosses about $3,000 a year, gives Farmers confidence and a feeling of purpose and belonging. But the Green Care Farm's value goes one step further. “Quiet, rural environments in nature provide relief to adults on the [autism] spectrum; they are often overwhelmed by the loud sounds and busyness of a city,” said Donna Brickett, founder of the Green Care Farm. Donna worked as a social worker with the Government of Alberta and she said she’s seen adults with autism and developmental disabilities require less support in farm-based programs; the Autism Ranch has a 1-7 ratio, compared to smaller, more intensive ratios with city programs. 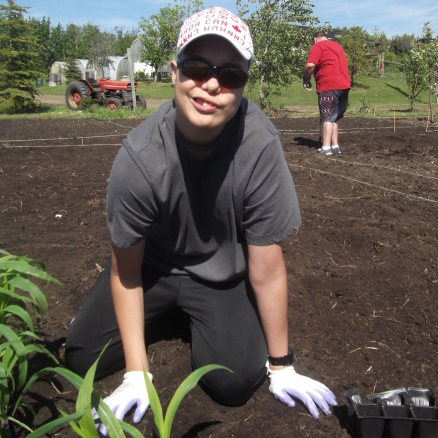 Having achieved success locally, she now wants adults with autism living in Edmonton to experience the rural lifestyle themselves. Donna also promotes the Green Care Farm as a sustainable housing option. Generally, adults with autism will apply for disability funding and subsidized housing. However, in Alberta, people with autism need an IQ score of 70 or below to qualify for housing support, leaving many high-functioning adults with autism without recourse. Ontario has around 14 000 adults with developmental disabilities on the waiting list for housing, making it a long process with no guarantee (Alberta doesn't have current statistics, but there are waitlists for disability housing in Edmonton and every surrounding community). These are the barriers to independence that adults with autism face. They often end up living with parents or siblings if they’re lucky; others turn to inner-city shelters, which exposes them to drugs and violence. This issue forms the core of Donna’s work at the Green Care Farm: the endgame is to provide a sustainable, alternative housing model for adults with autism. And this need is only going to grow; autism rates in Canada have skyrocketed over the last twenty years from 1 in every 5000 children, to 1 in every 68, with more of those children transitioning into adulthood. Like so many parents, autism has touched Donna’s life. She knew that country kids with autism like her 12-year-old son needed options too. The Green Care Farm was originally run on the few acres in Donna’s backyard. However, she plans to lease a small farm for next season in order to rent organic garden plots to their community, offer more children and youth interest groups, and offer programs during the offseason. However, this is still just a step; the ultimate goal is to purchase 80 acres of land and create a large, sustainable organic farm to provide housing to a large of number of adults with autism. This land will also allow her to develop an agritourism program, and build entertainment like a mini-putt course and petting zoo to create employment options for adults with autism and foster informal community interactions to educate about autism. Donna said she wants to inspire other communities to replicate this model. Green care farms have seen widespread popularity and success in the United States, and she said she wants to see that move north. The link between health and farming as a care model for vulnerable populations began in the Netherlands and has been proven to work. The nation now has over 700 care farms that benefit farmers, the environment, the community at large and support a range of vulnerable populations in healthy ways. “There are some big smiles when people arrive at the Green Care Farm - it's calming, rewarding and enhances their quality of life to be in nature, work with their hands and see vegetables grow from seeds,” Donna said. 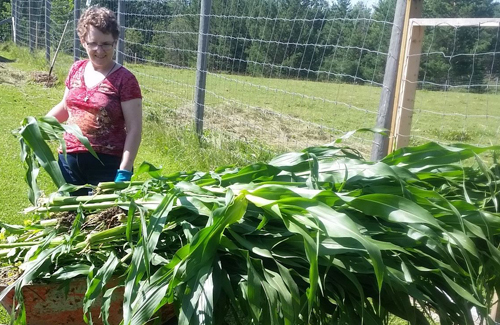 TechSoup Canada is proud to provide donated and discounted software to nonprofits like Green Care Farm, helping them save time and money that they can reinvest into their mission. “You discover you need a lot of different things as a nonprofit charity,” Donna said. When the Green Care Farm was starting out, TechSoup Canada was the first organization they went to for help. Donna ordered software to do her own accounting, operate her database, design marketing materials, and enhance her digital security. She also ordered Microsoft Office, and GrantStation to help expand her donor base. She said this software has been integral to helping her programs grow. “We are extremely grateful for the support of TechSoup Canada and the impact on our nonprofit charity,” Donna said. Check out the Green Care Farm's video below, or visit their website to learn more about their wonderful programming.